"Best Foot Music is a UK based ‘non profit’ organisation, working with musicians and communities who have come to live here, from elsewhere in the World. Our work includes making music recordings, organising events and supporting artists in whichever creative projects they wish to pursue. We aim to challenge negative stories around migration and support diversity in the community. The first people we started recording with were from Poland, living in Brighton and London. Over the years we’ve become good friends. Initially, we just made music recordings, but then realised we needed to give something back to the people we worked with. Many wanted us to help them with promotions and organising gigs. Often those who have only recently arrived in the UK, do not have access to the networks and resources available to those long established in the UK music industry. I get really excited every time the musicians we work with performing at a concert. Music genuinely helps break down social barriers and is a great way to bring people together. The war in Syria has resulted in many people having to leave the country, some of who have settled in Sussex. Many have arrived with only a few belongings, and need support. 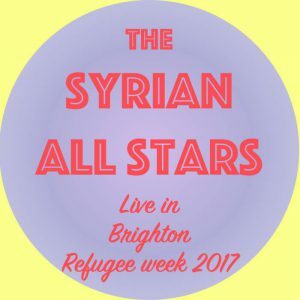 The Sussex Syrian Community Group was set up by people from the local Syrian community, and the Hardship fund is administered by the community. It pays for English lessons, day to day support and social events, which help people build friendships and community networks. We’re excited about the record for a number of reasons. Firstly, it will enable people to support the community and show support for those people who have sort refuge in the UK. Secondly, we hope the record will form an enriching and permanent document of some of the musical cultures that people bring to life in the UK, wherever they travel from and under whatever circumstances." Learn more about the awesome Best Foot Music cause on their crowdfunding campaign page and video below!